Scanning electron micrograph of the device showing the mechanically suspended optomechanical crystal (blue) with electrodes (yellow) and the photonic circuit (red). Scientists from UC Santa Barbara are making headway in quantum information transfer. They recently published a new study that describes a nanomechanical transducer that provides strong and coherent coupling between microwave signals and optical photons. Santa Barbara, California –– Fiber optics has made communication faster than ever, but the next step involves a quantum leap –– literally. In order to improve the security of the transfer of information, scientists are working on how to translate electrical quantum states to optical quantum states in a way that would enable ultrafast, quantum-encrypted communications. A UC Santa Barbara research team has demonstrated the first and arguably most challenging step in the process. 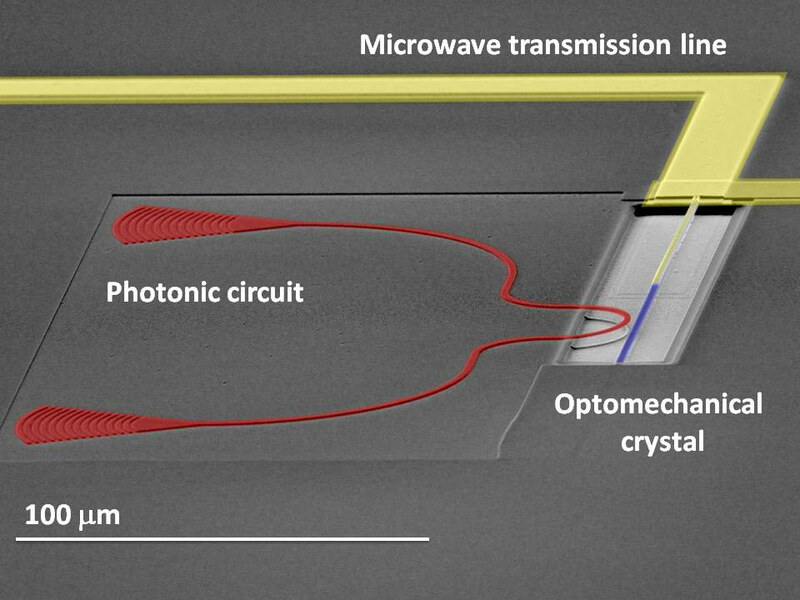 The paper, published in Nature Physics, describes a nanomechanical transducer that provides strong and coherent coupling between microwave signals and optical photons. In other words, the transducer is an effective conduit for translating electrical signals (microwaves) into light (photons). Today’s high-speed Internet converts electrical signals to light and sends it through optical fibers, but accomplishing this with quantum information is one of the great challenges in quantum physics. If realized, this would enable secure communication and even quantum teleportation, a process by which quantum information can be transmitted from one location to another. 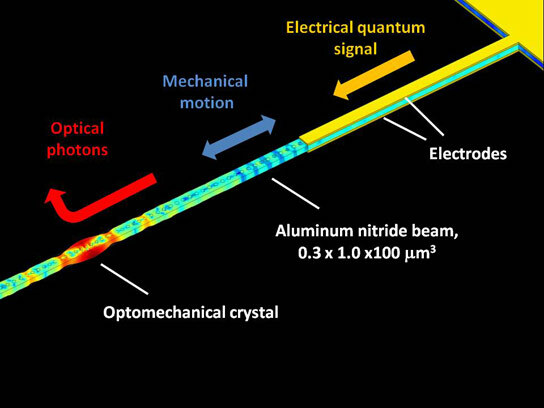 The new paper outlines the concept and presents a prototype device, which uses an optomechanical crystal implemented in a piezoelectric material in a way that is compatible with superconducting qubits, quantum analogs of classical bits. Operating the device at the single phonon limit, the scientists were able generate coherent interactions between electrical signals, very high frequency mechanical vibrations, and optical signals. According to the authors, their prototype transducer is fully compatible with superconducting quantum circuits and is well suited for cryogenic operation. “The coupled dynamics of the system should be the same at low temperatures as in our room temperature measurements, albeit with a lower thermal background,” said co-author Andrew Cleland, a professor of physics and associate director of the California Nanosystems Institute at UCSB. “Genuine quantum features and non-classical mechanical states will emerge when we couple a superconducting qubit to the transducer. “We believe that combining optomechanics with superconducting quantum devices will enable a new generation of on-chip quantum devices with unique capabilities, as well as opening an exciting pathway for realizing entangled networks of electronic and photonic quantum systems,” Cleland said. 2 Comments on "Scientists Make Headway in Quantum Information Transfer"
Has anyone noticed that the kind of work given in this article has increased exponentially since the deposit of my theories on an, ‘Electromagnetic Universe’ in June 2011 with Durham University. @C Peter O’Connor: Did you do some research that got this going? I have been reading up on this lately, but this is the first time I’ve seen a diagram of an apparatus to encode bits into quantum states. Everything else is just math or crude analogies to the macroscopic / classical world. My understanding is if this works, we could eventually exceed the Shannon Limit for a channel. It could be deployed in wireless networks. That’s the part that interests me.